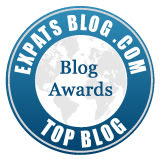 Expat Adventures in Singapore: Expat Blog Awards 2012 - I've Been Nominated! I received some exciting news in my inbox this morning, that I'd been nominated for the Expat Blog Awards 2012! I'm up against some fierce competition, some amazing talent and fabulous blogs, but to even be nominated is a real honour for me. Of course I'd love to win too and you can help me (if you want to) by clicking here and leaving a kind comment about my blog. You can view all the other amazing Singapore blogs that have been nominated here. The judging panel will make their decision on the 15 December 2012, so please spare a moment to leave a comment for me - thank you! Amendment - I've since found out that the Expat Blog Awards 2012 will be decided throughout December and they'll be publishing the results for several countries daily, beginning on the 4 December 2012. So please do comment on my blog's link if you would like too. Thank you!